Here is Some Information about Vadivudai Amman Temple in Tiruvottiyur Tamil Nadu India. Vadivudai Amman Temple is located Sannadhi Street, Tiruvottiyur, Chennai, Tamil Nadu India.The temple was built about 2000 years ago.The temple is dedicated to Lord Shiva.The temple is revered by the Tevaram hymns of Saiva nayanars, the 7th century Tamil saint poets and classified as Paadal Petra Sthalam.this temple is referred either as Adipureeswarar temple or Thyagaraja temple. Lord Shiva is available in this temple in three main forms - formless, physical form, and also in an indescribable form.The goddess of the temple, Vadivudai Amman, is very powerful, and she is one of the three main goddesses of Chennai region.The main shrine of the temple has the big Shiv Linga named Adi Pureeswarar. 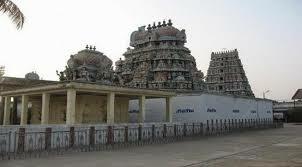 Hence, this temple is also named as Adi Pureeswarar temple. Adjacent to the main shrine, the shrine of Thyagarajar is located. Vadivudai Amman is seen in a separate shrine. Apart from these three main shrines, there are a lot of shrines in this temple. 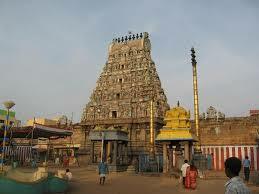 Some of the notable shrines are 27 star Shiva shrines and Tiruvotteeswarar shrine. Other deities present in the temple include Thiruptheeswarar, Kuzhandhai Eesar, Jaganadhar, Annamalayar, Jambukeswarar, Nagalingar, Meenakshi, Sundareswarar, Sagasralingam, Amirthakandeesar, Gowrieeswarar, and Ekabaadhar. The temple is associated with the saint poet Sundarar and Pattinathar. The temple has been in existence from the Pallava times of 7th century and widely expanded by Chola kings during the 11th century. The temple has a seven tiered gateway tower and a tank with area covering 1 acre. The temple draws parallel with the Thygaraja temple in Tiruvarur as both the temples were expanded by Rajendra Chola I and both have the same dance poses of Lord Shiva. 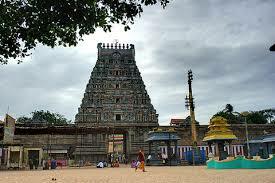 The temple was originally built by Pallavas and later rebuilt by Rajendra Chola I. The inscription dating 954 CE, the fifth year of the Chola king Gandaraditya indicates 90 sheep for burning lamps and ilavilaku. The inscriptions dating from 1046 CE reveal that 64 bronze Nayanmar statues were installed in the temple. There were equal number of dancing girls called Devadasi in the temple who were divided into two groups, the Valankai Dasis danced for Thyagaraja and the Idangai Dasis danced for Vadivudaiamman. During the reign of the Malik Kafur, much of the temple was destroyed and the bronze idols present now in the temple were installed during the Vijayanagara period of 15th century. 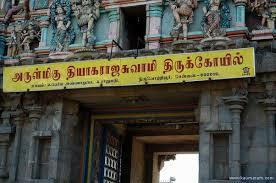 Famous saints like Pattinathar, Topeswamigal and Ramalinga Swamigal lived in this town and prayed Thyagaraja in this temple. This place is also home to Thiruvottiyur Thyagayyar who is a Carnatic composer and poet. By Road : There are many public and private vehecals available to reach Vadivudai Amman Temple in Tiruvottiyur. By Rail : The Nearest Railway station is Chennai Junction. (7 Km). By Air : The Nearest Airport is Chennai International Airport(7 Km).